Trash Pickup: The Town of Cooleemee has a contract with Republic Services (GDS). Household waste is required to be bagged and put into an approved receptacle and placed at roadside. Pick up day for garbage is Friday morning. Street Lights: Street lights are maintained by Duke Energy. If you notice a light out please call Duke toll free at 1-800-769-3766 and report the outage. You may also call the Town Hall for assistance. Animal Control: The Town of Cooleemee does have a leash law. Your dog must not be able to roam off your property. There is a fine of $ 50.00. If your dog is picked up you must call Animal Control at (336) 751-0227. Cemetery: Legion Memorial Park cemetery is managed by the American Legion and the VFW in Cooleemee. Please call Dell McCullough for information. Code Enforcement: It is important to make yourself aware of the Town of Cooleemee’s Code Enforcement. The Town adoped Code of Ordinances. A few examples of regulations are: overgrown grass, trash in the yard or an accumulation of bags of trash. You may report a code enforcement violation to the Town Clerk at Town Hall or you may file a complaint through the website of our code enforcement agency at www.alliancecodeenforcement.com. These reports are confidential. Taxes: Property and Vehicle tax for Cooleemee are administered from Davie County. If you have questions about your tax values or any tax questions, call the Davie County tax office at (336) 753-6130. 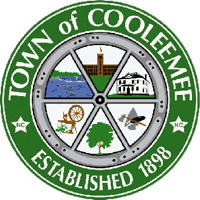 Street Maintenance: The Town of Cooleemee is responsible for any and all road repairs inside the Town. If you have a drainage problem or see areas where street repair work is necessary please call the Town Hall. Speed Limits: The speed limit in Cooleemee is 35 miles per hour unless otherwise posted. Most of our streets are set at 25 miles per hour. Due to some narrow streets and children playing we ask you please obey the speed limit for everyone’s safety. Leaf Pickup and Cleanup Days: The Town of Cooleemee provides “leaf pickup” services in the fall of each year. Leaf pickup usually starts in October and ends in February. A pickup schedule will be posted as the fall season approaches. In the fall of the year a general cleanup time is sponsored by the Town. A notice and schedule will be posted as the fall season approaches.